Storm Freya is forecast to bring winds of up to 80mph and dangerous conditions to the UK on Sunday. The Met Office issued a severe warning for risks of injury and danger to life from flying debris and large waves. Damage to buildings and trees, travel disruption and power cuts could also be possible. The warning, from Sunday afternoon to Monday morning, covers parts of Wales, south-west England, the Midlands, northern England and southern Scotland. It follows a week of recording-breaking winter heat in the UK. Met Office spokesman Grahame Madge said winds of 55mph to 65mph were “likely quite widely within the warning area”, with the potential for gusts to reach 70mph and 80mph in coastal areas. 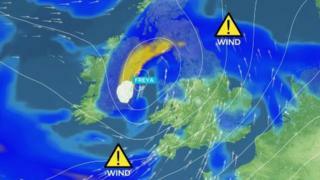 Wind speeds are expected to be highest in Devon, Cornwall, Wales and north-west England. BBC Weather’s Gemma Plumb said the storm, moving in from the south and west of the UK, was expected to push north across much of the country on Sunday. Travellers are advised to plan journeys ahead, as road, rail, air and ferry services may be affected with longer journey times and cancellations possible. Some roads and bridges may also have to close. The storm warning comes after a week which saw the UK break its warmest winter day record on two consecutive days, with 21.2C recorded in Kew Gardens, London, on Tuesday. The Met Office has also provisionally announced that last month was the second sunniest February on record for the whole of the UK. The forecaster said there were average maximum daily peaks of 10C, beating the previous record of 9.8C set in 1998. Last February, temperatures in the UK plunged as low as -11.7C at South Farnborough, Hampshire.